Thick cut, USDA Choice filet mignon, pan seared then baked in the oven or grilled if you prefer, and paired with a wonderful green peppercorn sauce. Melt in your mouth tender served with a side of mashed potatoes to sop up that wonderful peppercorn flavor or vegetables. USDA Choice filet mignon steak, beef broth, green peppercorn, tarragon, onion, carrot, bay leaf, garlic, flour, tomato puree, cream, potato. Season steaks with salt and pepper to taste. Rub corn oil on both sides of each steak. For baking: Preheat oven to 500 F. Heat a skillet on high heat. Sear the steaks 30 seconds per side. Place steaks into the oven either in oven safe skillet or supplied foil pan. For medium, bake 2 minutes per side. For medium well, add 1 minute per side. For grilling: Preheat grill to 500 F. For medium, grill 3 minutes per side. For medium well, add 30 seconds per side. 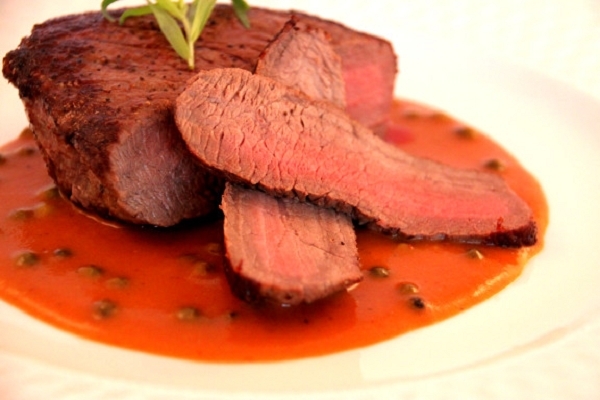 Let meat rest 3-5 minutes while reheating peppercorn sauce as well as mashed potatoes in sauce pan or microwave. 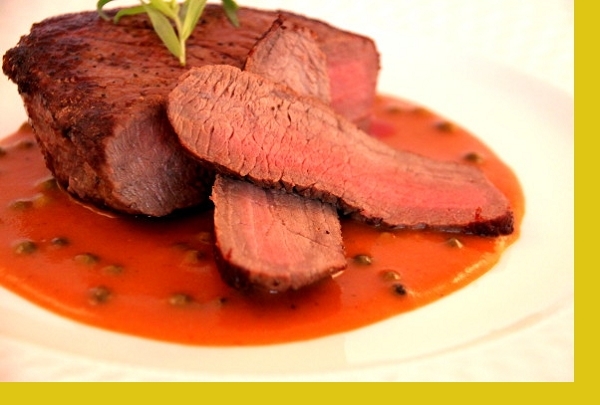 Excellent filet, very tender and great taste! This has become a staple every time I see it on the menu! Parents love this! Tender and yummy! Delicious meal. The beef is tender and the sauce is the perfect touch. Mashed potatos were divine. delish, delish, delish. The prep was super quick and easy and the steaks were incredibly tender and delicious. We served with asparagus. Would definitely order again. Delicious, melt in your mouth! The steaks were incredibly beautiful...perfect in every way. The sauce was so good! It was easy to prepare. Tender and delicious! The potatoes were nicely seasoned, but the meal really needed an additional steamed veggie or a salad. The filets were excellent quality, with the peppercorn sauce, what a fantastic dinner. What a great date nite dinner.